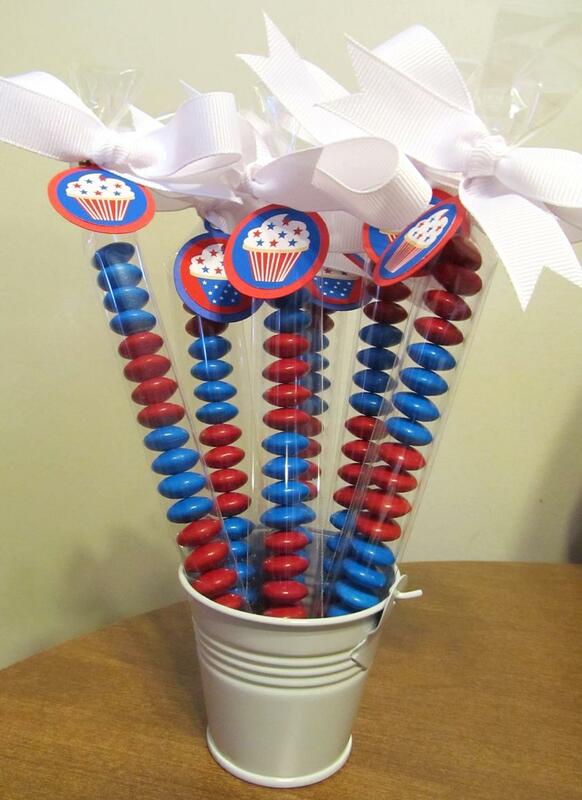 Here is an easy and cute party favor for the 4th of July that everyone will love! Stack M & Ms or Skittles in tall, skinny cellophane bags. I alternated layers of patriotic red and blue candy. The possibilities for this idea are endless. It's a perfect favor for any theme, color, or type of party. Just coordinate the candy color and tag with your theme, tie on a pretty bow, and you'll thrill your guests. You always have the best party ideas! They would look even better with my personalized ribbon! I just read the bowling party post, and this one...I am having a Pinkalicious B-day party! Wondering where you found the long cellaphane bags for the candy? You can find them on etsy.com. Just do a search for cello bags 1 x 8. Hope this helps.